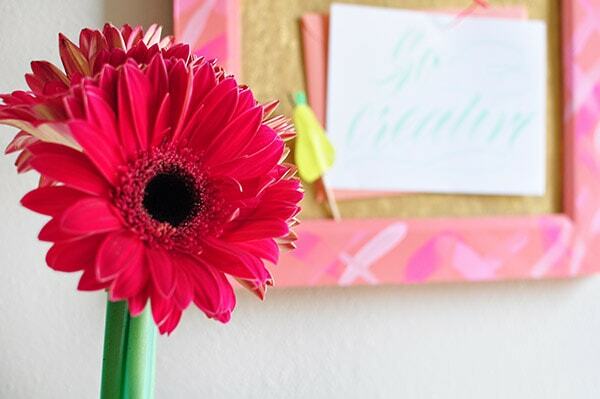 Being organized is something I love and value. It helps me keep a clear mind, it allows me to stay on task without worrying that I’m forgetting something and when I can do all that AND make it pretty… it’s icing on the organized cake! 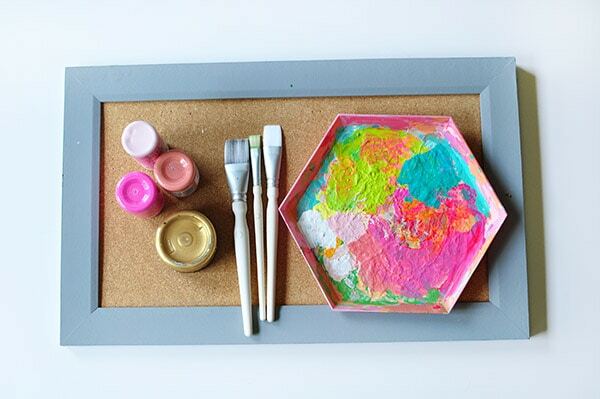 Today I am glad that I’m a hoarder and that I kept this old cork board around because it got a makeover! 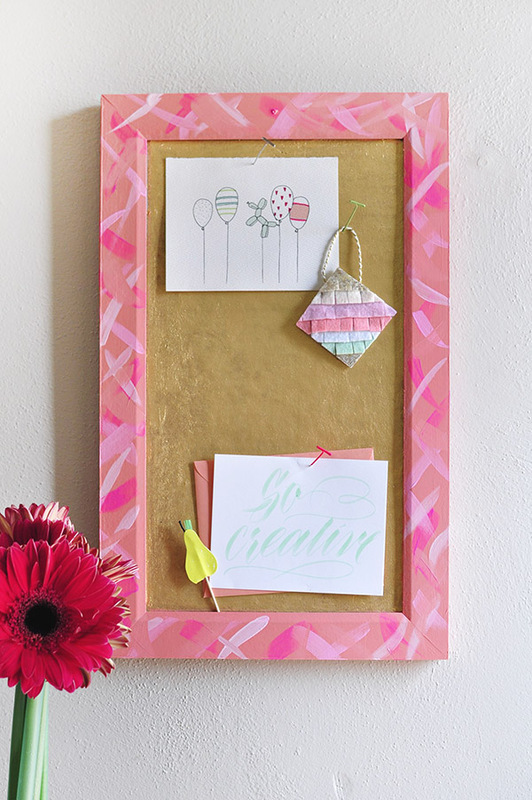 Check out how I created this cheerful DIY Brushstroke Gold Cork Board. Recently, my friend Marlene, from Idle Hands Awake, revealed her gorgeous workspace and my mouth DROPPED when I saw her Copper Magnetic board. 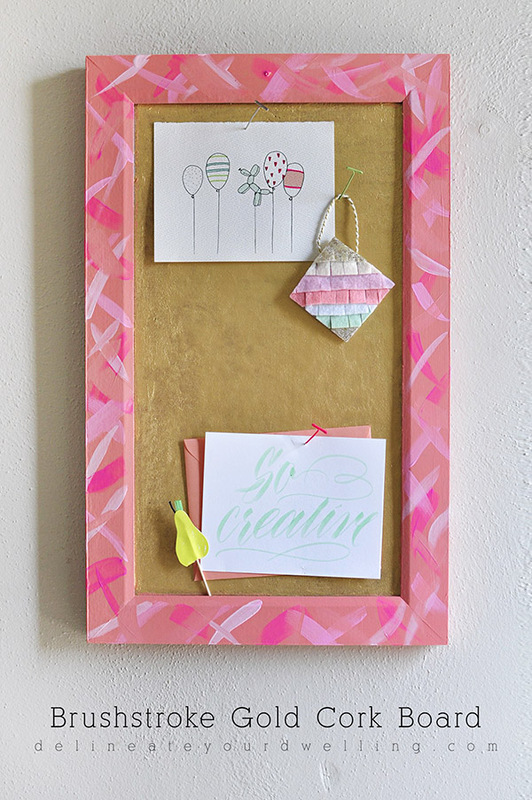 It made me start thinking… and I decided to give PAINTING a cork board with Gold Foil paint a try. I’m sure after tons of use it will crack off but I poked pushpins in and out and it looks like it’s there to stay for a good long while. Cool!! I have used this Gold Leafing Finish paint on numerous projects and I just love it. It paints on so easily and really has the perfect gold foil shimmer. (I also have it in Copper and equally love it.) 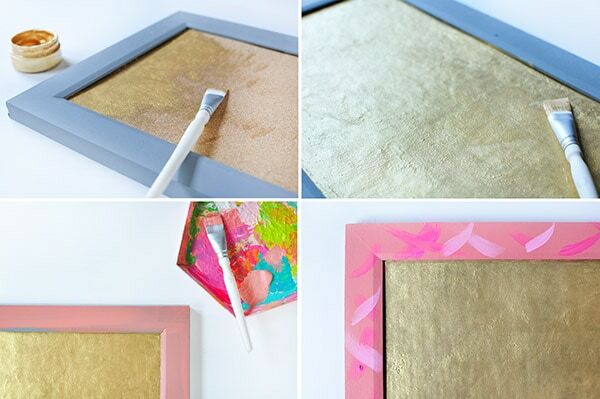 The first steps were to paint the gold leafing onto the cork board. I gave the entire board one coat and then after it dried, did a few touch up areas. Next, I painted the frame a bright coral color. Then it was brushstroke time! 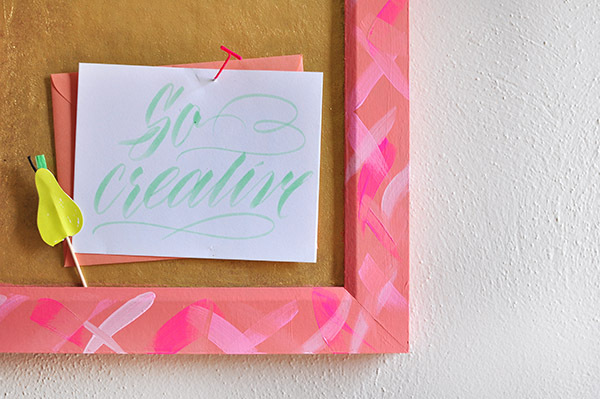 Using a Barbie Pink and a soft pink paint, I added layers of brushstrokes to the frame. There really is no technique or pattern, just have fun with it. After it was dry, up on the wall it went! You can see a little more detail of how the gold foiling cork portion turned out, below. I also painted a few pushpins because… why not. 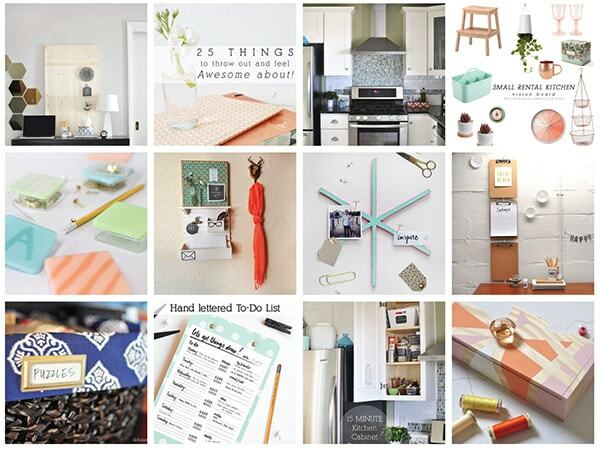 And if you thinking being organized AND keeping it pretty are as important as I do, then you will probably want to check these out also. I need a new message board and thank you for a lovely idea. Don’t know if I can get the gold leaf paint here but shall do my best with what I have got. Again thank you. 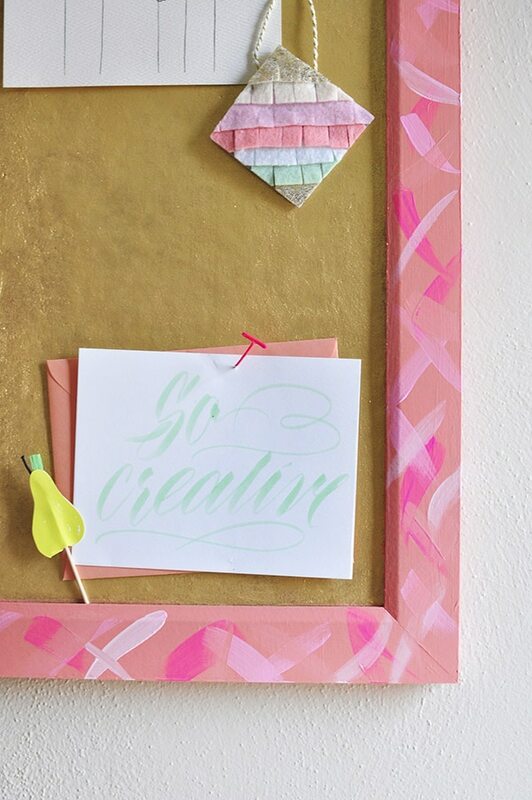 What a fun notice board! 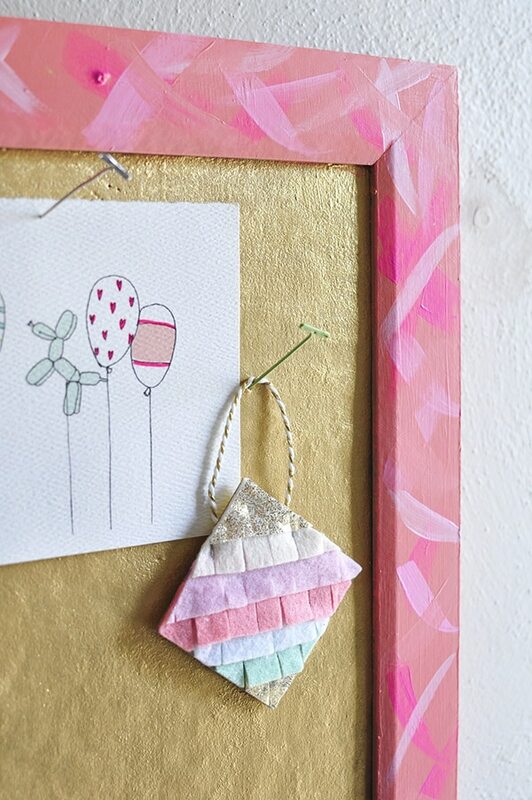 I painted the back of my corkboard gold too and just love how it looks 🙂 Thanks so much for linking up with us at The DIY Collective! Ah, how fun Erica! I’m going to go over and find yours!